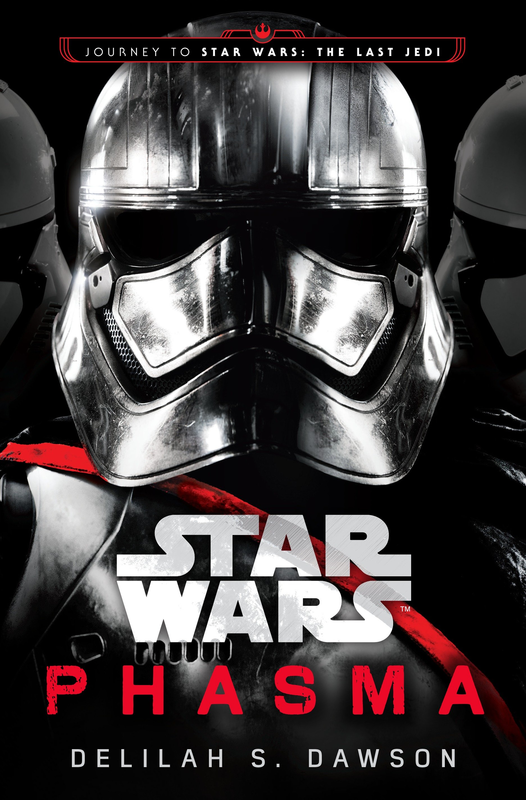 Star Wars: The Last Jedi is a little over three months away so why not fill the long wait then by learning about Captain Phasma’s desolate home world of Parnassos and her first encounter with the First Order. I’ve begun reading the book myself and so far it is excellent. Check out the excerpt from the audio book and two more excerpts you can read as well. If your a Star Wars fan and wanting to learn more about Captain Phasma then you should give this newest novel a try. When they reached the line of flags delineating the borderlands between the Scyre and the Claw, Phasma called a halt and pulled out her quadnocs. Five figures were being pulled up onto the plateau from the land below. Using the lenses, Phasma followed the foot­prints and drag marks back to where a metal machine waited, half submerged in the sand and beside a huge, crumpled piece of fabric. It was the part of the ship that had popped off and gently floated down. The Scyre had never seen so much fabric in one piece in all their lives, and it was clear why several Claw members were down there, busily cutting the long lines that held the fabric to the machine so that they might claim it for their own. The downed ship was nowhere in sight, but far, far away, across the sands and yet more rocks. Phasma tracked the thin line of white smoke that feathered up into the sky, marking the path to true riches. A cheer went up from the gathered Claw as the first strange figure was dragged to standing on top of the plateau. It was a man, and for Parnassos, he wore very little, just finely woven clothes of a smooth, uniform black and tall, shiny boots speckled with sand. He was the oldest person the Scyre folk had ever seen, with pale-white skin and red hair going gray at the edges. Although his limbs were slender enough, his belly was big, and he had dark circles under his eyes. He smiled blandly at the whoops and whistles of the Claw folk but was clearly not celebrating, personally. Vi was trained to remember every detail when it counts, but even she can’t keep up with the labyrinthine twists and turns of the enormous Star Destroyer’s guts. Long hallways end and intersect, and turbolifts up and down make it impossible for her to recall their route. It’s one thing to see pictures of ships like this one, but it’s another thing to really understand the enormity of their enemy’s resources. As he guides her into another lift, the man in red stands in front of the panel so she can’t see which level they’re headed to. “Your place or mine?” Vi asks, hoping to goad him into moving aside. But the man in red is silent. When she slowly begins to take her hands down, he clicks his tongue at her. When the lift doors open, the lighting is dim and flickering, and there’s something dripping, maybe runoff from the vent system. They’re deep in the bowels of the Star Destroyer, then, in an area that’s generally off-limits or beneath notice. And that’s not good for Vi. Even the First Order has rules, and the red trooper is breaking them. If this guy kills her, he won’t even have to do datawork. She’ll just be another load of garbage sliding down toward the incinerator. Great. The Resistance doesn’t know much about the enemy they’re facing, and the New Republic doesn’t consider them a threat, which means Vi hasn’t been briefed on the protocol these people generally follow. She doesn’t know what to expect. She’s been trained to resist interrogation, but she also doesn’t know what new toys this guy in red might have. A chill trickles down her spine. She might be in over her head. The blaster doesn’t leave her spine. Her captor gives her directions—turn here, turn there—but doesn’t respond to her taunting. Finally, he presses a long code into a control panel on the wall, and a door slides open far less smoothly than Vi would expect in what’s obvi­ously a new ship. The room isn’t large, maybe three meters by four, and it clearly has only one use: interrogation. Well, two uses, if you count torture. Three, if you include the inevitable death promised by the fact that she’s not going to give up any intel on the Resistance. The space is dominated by an interrogation chair, and the only other fur­nishings are a simple table and two rickety metal chairs, a place for the bad guys to sit down with a cup of caf and go over their notes while their victim bleeds out, probably. After strapping her in, he checks the panel monitoring her vital signs, flicking it with a finger. “Your heart rate is up,” he notes. His red helmet tips, just a fraction, conceding the point. As she watches him, he moves around the edges of the room, double-checking the cam feeds his droid already shut off, as well as what she’d guess is the comm system. The droid hovers ominously beside his shoulder, and he makes the rounds slowly, as if giving a warning. No one else is watching. There will be no interruptions, no reprieves. This is not how the First Order does things. “So this is personal,” Vi notes. He stands before her now, legs spread and arms crossed. His blaster is clipped on his hip, red and gleaming. His red-gloved fingers tap against it, another reminder. It’s just the two of them and his droid. Anything could happen. Vi is too well trained to grin.